In late 1933 and early 1934 Mir's drawing, which had been deliberative and austere, suddenly became freer and more spontaneous. His painted compositions are characterized by a greater linearity; in them "Mir was carried away by sheer joy in drawing". 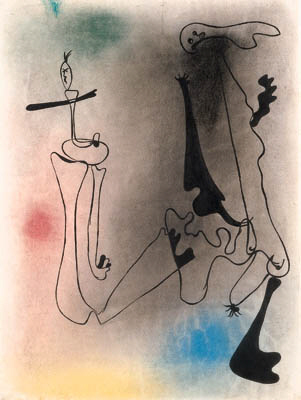 This freer approach owes much to contemporary developments in Surrealism, especially the increasing interest in automatist drawing. The looser, improvisatory nature of Mir's new linearity bears comparison with the strange creatures in Tanguy's pictures, and, to a lesser extent, with the sweeping and gestural line of Masson. An interest in drawing normally leads to a greater emphasis on the figure, and as in the present work, figures become the center of attention. During the following year Mir entered his "monster" phase, in which his figures are characterized by increasing grotesquerie, as violence and a heightened sense of anxiety drive the narrative within his pictures (see lot 526). A photo-certificate from Jacques Dupin dated Paris, 5 January 1998 accompanies this work. Please note that the work is signed and dated 'Joan Mir 26/3/34.' (on the reverse). The correct medium is watercolor, pastel, pen, brush and India ink on paper.